France, perhaps Langres, ca. 1485-1490. Owned by the College of Jesuits at Laon (Collegium Lundunaeus Socitatis Jesu); A. Firmin-Didot sale (Paris, 1884, no. 18) to Tumin; sold (Nov. 1885) by J.O. Wright to Theodore Irwin; purchased by J. Pierpont Morgan (1837-1913) with the Theodore Irwin Library in 1900; J.P. Morgan (1867-1943). 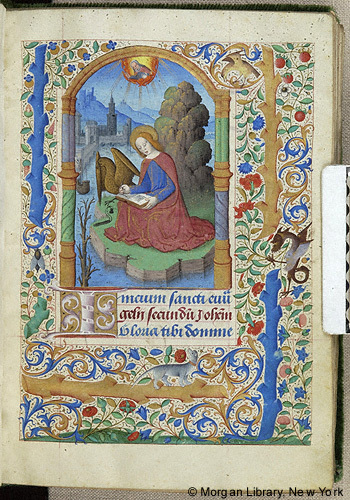 Ms. book of hours for the use of Rome (Hours of the Virgin, Office of the Dead); written and illuminated in France, perhaps Langres, ca. 1485-1490. Decoration: 31 miniatures with border decorations.